Ever since I first reviewed Hpno5e's Des Deux L'une Est L'aurte a few weeks back, I've been insanely hooked on it. It's had quite the coveted space on my Ipod, and has gotten me through many a long wait at the bus stop. It also makes me curse my luck for not being able to see them live when they rolled through the Detroit area this past January. Damn me for not having a car! I've been wanting to hear some more from these guys, and my wishes have been answered, just not in the form I thought. A way more surprising form. 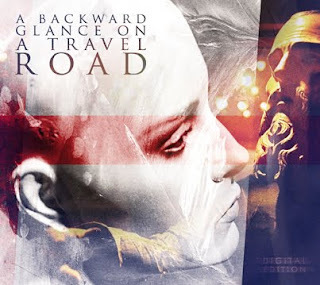 A Backward Glance On A Traveled Road is the side project of Hypno5e's Emmanuel Jessua and "personal favorite drummer of the year so far" Thibault Lamy. Unlike Hypno5e, ABGOATR is a nearly entire acoustic affair, with very little vocals and more reliance on ambient sound effects and spoken word bits. It's very similar to what Opeth did with their Damnation album: take the heaviness out and let the softer side out. Immediately I was struck with how Pink Floyd-ish the whole Album sounded. Inventive, yet streamlined to perfection. The concept is to emote a special emotion for each song, but the album as a whole felt dark and evil. Now granted, that a VERY good thing, but I couldn't help but think that I've felt this way with music before. Then it hit me. This is the heavy metal equivalent of the Silent Hill soundtrack! Don't believe me? Here's a comparison. Now, I'm not calling plagiarism here. I just get a charge when great minds think alike. Another case in point. Track three, Johnny Git His Gun, is a direct homage to the film of the same name, in which a soldier of war becomes trapped in his own head, with no way to communicate to those around him. Learned metalheads will identify that with the video for Metallica's One, which used clips from the flick to go along with the lyrics to show the horrors of war. ABGOATR themselves use sound clips of the comatose soldier to convey loneliness and solitude. Both get the message across, but ABGOATR has to make you see in your head what hell this guy is going through. Dark stuff indeed. The best part of this cd? It's for FREE! Yep, totally free for all of us capitalistic swine to devour.You can get your copy of the cd at their home site. While you're at it, why not a donation to the band? The guys did the artwork and music out of their own pockets, so a little gratuity wouldn't hurt. Hell, they may even make another one if we're lucky. You can toss a few bucks their way once you download the album. Final Verdict: ABGOATR will not be for everyone. It's not tr00 or kvlt. It favors piano solos over guitar wankery. And yet, it also gives you the sense that Hell is right around the corner..... and they brought Pyramid head with them. Rating: Slaytanic!